OCTOBER MEANS DIFFERENT THINGS FOR MANY PEOPLE. For most, it means the coming of autumn, the holiday season and pumpkin-flavored everything. While others might see colder weather as the end of outdoor fun, in Texas it means that boost season is fast approaching. 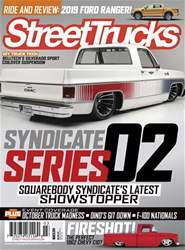 Houston Performance Trucks has seen a growing community in the truck scene, both in racing and customization. The club wanted to help bring both passions together in one great event for every enthusiast. So in 2011, after months of hard work and stress, it all came together for their first innaugrual show.